Who Pooped in the Park? 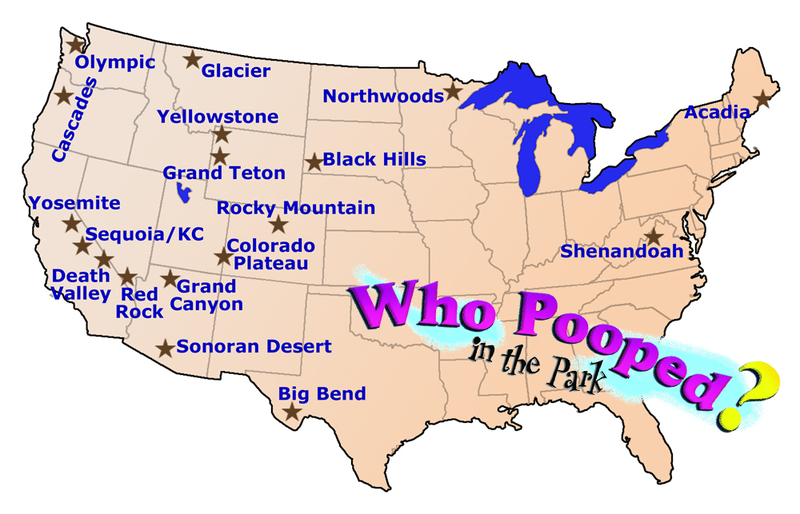 A few years ago, I got to wondering how many different states were covered by my Who Pooped? series, and it led to a blog post that is now obsolete, as the series has grown since then. This post updates and replaces that one. In the beginning, each book in the series was for a specific national park, and most of those national parks were tucked securely in a single state (Yellowstone does span three states, however). As the series progressed, the books covered more ecosystems than specific parks, and sometimes those covered multiple states. That got me thinking: what states does this series cover? So far, the series covers 19 states in 20 books — some books cover multiple states and some states have multiple books. The number of national parks, national conservation areas, national monuments, national recreation areas, and national forests is significantly larger than that. I haven’t compiled that list lately. A project for another day! Who Pooped on the Colorado Plateau? Who Pooped in the Sonoran Desert? Who Pooped in the Cascades? Who Pooped in the Redwoods? Who Pooped in the Northwoods? Who Pooped in Central Park? Who Pooped in the Black Hills? NOTE: The information in this post is obsolete, but it’s all been brought up to date in a new post from 2017. My 23rd book — 18th in the Who Pooped? series — is now officially out. In the beginning, each book in the series was for a specific national park, and most of those national parks were tucked securely in a single state (Yellowstone does span three states, however). As the series progressed, the books covered more ecosystems than specific parks, and sometimes those covered multiple states. That got me thinking: what states does this series cover? So far, the series covers 18 states in 18 books — a coincidence, since some books cover multiple states and some states have multiple books. The number of national parks, national conservation areas, national monuments, national recreation areas, and national forests is significantly larger than that. I haven’t compiled that list lately. A project for another day! So, given that my publisher is most interested in covering well-traveled areas, what do you think should come next? The next one is pretty well decided, although we’re not announcing it until a contract is signed. What should the 20th book be? I’d love to hear some feedback? A huge milestone in poop!